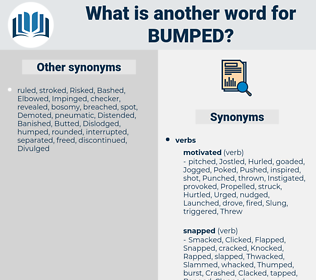 What is another word for Bumped? 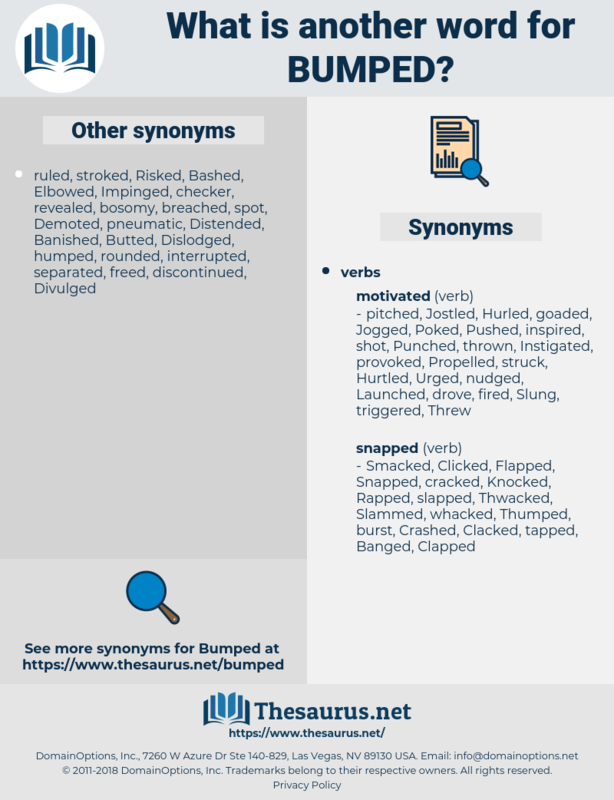 Stumbled, decreased, impacted, collided, moved, Slipped, Flipped, collapsed, dipped, Encountered, Declined, Became, dabbled, broke, struck, interviewed, Crashed, HIT, Ducked, Slammed, drove, Rammed, shocked, Tripped, landed, Met, Went, Ran, FEII, Got. Buoyed, reinvigorated, Spurred, stimulated, spearheaded, rescheduled, disturbed, Pushed, Furthered, dislocated, translocated, invigorated, Propelled, motivated, removed, misplaced, collided, galvanised, sponsored, Promoted, Underpinned, Supplemented, impelled, Prompted, Bolstered, moved, resettled, compelled, triggered, touched, augmented, Displaced, relocated, Boosted, inflated, rolled, increased, HIT, powered, driven, fueled, fuelled, travelled, Rammed, Transferred, Shifted, fostered, led, Nicked. The wagon had actually been bumped by one of the running buffalo. The only rift in the surveyor - general's lute is the fact that while he has never yet bumped up against the right man, he is due to so bump in the very near future. bomb, bombie, bump off, bamboo, bumph, bonobo, bomb up, bimbo, bumpy, bump up, bone up, Baffin Bay, bombay, benumb, bumf, banff.